The biological clock depends on spontaneously firing neurons of the suprachiasmatic nucleus (SCN). Several ion channels, including L-type calcium channels, Ih, and subthreshold TTX-sensitive sodium channels, have been nominated for the spontaneous interspike “pacemaker” current that drives spontaneous firing. To distinguish between these candidates, Jackson et al. recorded from dissociated SCN neurons in current clamp and then used the firing pattern of each cell as a voltage command, the “action potential clamp” technique. This method is ideally suited to determine currents that are active during each phase of normal activity. The subthreshold sodium current, with some help from a “background” conductance, was essential in depolarizing cells to threshold. L-type calcium channels contributed a small net inward current late in the interspike interval, but calcium-activated potassium channels countered their contribution during most of the firing cycle. When the sodium current was blocked, L-type channels were only able to support slow oscillations at more depolarized potentials. Neuronal shape and movement depend on the actin cytoskeleton that is itself regulated by many structural and signaling molecules. The Ena/vasodilator-stimulated phosphoprotein (VASP) family of actin-regulatory proteins binds to F-actin and promotes long unbranched actin filaments as well as filopodia. In the mammalian CNS, they are found at sites of “action,” such as lamellipodia, filopodia, and focal adhesions. Based on analysis of invertebrate mutants, Mena, VASP, and EVL (Ena-VASP like) are thought to control functions such as axon and dendrite guidance and cell migration. However, mice lacking either Mena or VASP have relatively mild phenotypes, presumably because of their overlapping expression and function in mammals. Thus Menzies et al. made double knock-out mice lacking both Mena and VASP. As predicted, the phenotype was much more severe. The mice died just after birth and had defects in formation of the neural tube, craniofacial structures, and multiple axon pathways. Even one wild-type allele was enough to rescue many of the defects, confirming the interchangeable function of the family members. The African fish Gymnarchus niloticus uses a weak, quasisinusoidal electric organ discharge (EOD) to both communicate and navigate. The problem is that if neighbors use the same signal, it creates a serious “who's who” problem. 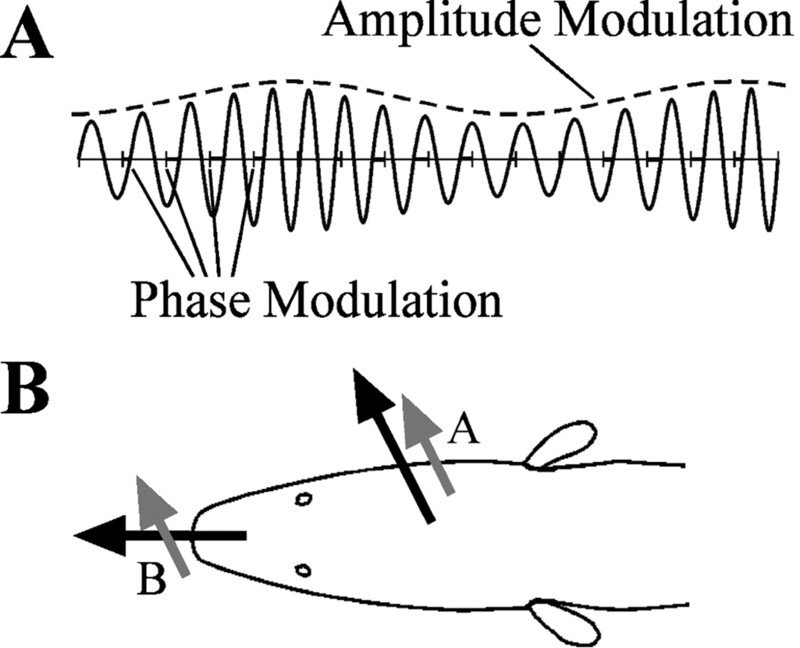 The fish deal with this by shifting the frequency of their EOD, the “jamming avoidance response.” To determine the frequency difference (Df) between EODs, the fish use amplitude modulation (AM) and phase modulation (PM) information that converges on “combination-sensitive” neurons in their midbrain. Carlson and Kawasaki used single-unit recording to examine the response of combination-sensitive neurons in response to AM- and PM-sensitive inputs. The inputs summated in a nonlinear manner to allow the units to report the sign of the Df. When the AM and PM stimuli were aligned, the units were facilitated, whereas the same units were suppressed when the stimuli were offset. Thus the relative timing of the inputs provides a mechanism for determining the sign of the response. A, Combining two sinusoidal signals results in AM and PM at a frequency equal to the Df between the two sinusoids. B, The EOD of the fish is generated internally, leading to current flow perpendicular to the surface of the skin at every point (black arrows), whereas the neighbor's EOD is generated externally, leading to current flow through the fish in a single direction (gray arrows). See the article by Carlson and Kawasaki for details. Shearing or stretching of axons during brain trauma is an insidious cause of cell injury and death. This week, Arundine et al. explore some of the underlying cellular mechanisms in an in vitro model of sublethal stretch injury. Cultured neurons were grown on flexible membranes and then exposed to a 1 sec vacuum pulse that stretched cell processes by 130%. The stretch did not kill the neurons but did make them more vulnerable to excitotoxic death mediated by low concentrations of NMDA. Stretch caused DNA fragmentation, but the authors could find no evidence of caspase-dependent or -independent apoptosis. Instead, the cells suffered mitochondrial dysfunction and produced excess reactive oxygen species (ROS). The ROS increased neuronal vulnerability by combining with nitric oxide (NO) to produce peroxynitrite, leading to protein nitration, DNA degradation, and cell death. NO was not the direct product of stretch but specifically required NMDA receptor-mediated signaling pathways.